Wash your fleet of heavy-duty trucks and vehicles the better, more efficient way with a large vehicle washing system from Westmatic. It'll get your private or public fleet gleaming in no time. We've had over 40 years of experience in the world of vehicle washing systems and vehicle cleaning technologies and we have narrowed our offerings down to only the best. Westmatic offers three large vehicle wash systems that are all extremely efficient, and capable of reducing your overhead costs of water, electricity, and chemicals. We're the greenest option for cleaning your large vehicles. Our Rollover Wash Systems are the most versatile on the market. A top brush and vertical side brushes roll intelligently around mirrors and other vehicle features that protrude from the surface. No other brushes get the same amount of detailing on so many types and sizes of vehicles. It uses less water, chemicals, and electricity than other systems and those savings don't take away from the power of our high-pressure nozzles and pumps. 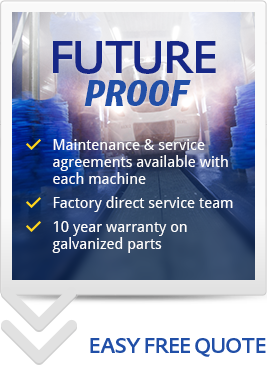 Each system is outfitted with the latest PLC technology and comes standard with an LCD touchscreen wash program selector, and step-by-step self-diagnostics and troubleshooting. Drive-Through Wash Systems have the smallest footprint of all of our products because of its compact size and smaller resource requirements. Retrofit your existing wash bays with this smart solution. Vertical brushes move into the center of the wash bay and clean the fronts and rears with an overlapping action that does not miss an inch. Like all of our models, the drive-through uses less water, chemical and electricity than the rest. The driver is guided through the entire wash process with a familiar-looking traffic light system. It's so driver-friendly, anyone can use it. The entire wash process is monitored and adjusted with a computer that is managed from an LCD touchscreen wash program selector. Touchless Wash Systems are perfect for irregularly-shaped large vehicles and equipment. It cleans with robotic high-pressure arches that provide a consistent wash every time. Our Automatic Vehicle Sizing/Contouring System tells the robotic arches how to wash the front, rear, and sides of the vehicle, all the time self-adjusting to different widths and irregularities of heavy vehicles and equipment. For the wash system to operate effectively, the proper utilities are needed for the wash bay. Water, electricity, and drainage are just a few of the elements needed. Once you have those, a Westmatic system can be put into place. That's when the magic begins. With all of their sophistication, Westmatic's equipment remains very simple to operate and maintain-they require less than 30 minutes of preventative maintenance and mechanical adjustments per month. Equipment is very easy to customize for various fleet configurations and budgets. 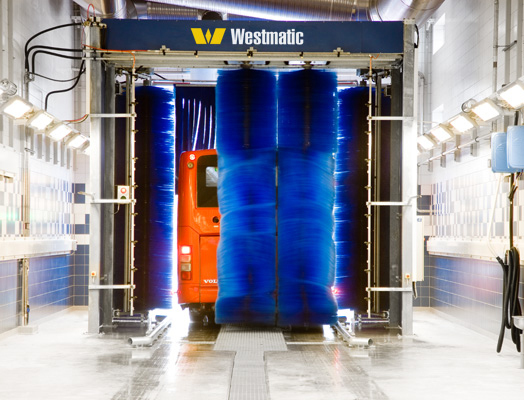 Contact Westmatic first before you set up your large vehicle washing station.